The posture and form you create while your moving has a paramount impact on how you feel and so of the nagging injuries you might endure. Kelly Starrett does a fantastic job explaining here how not having your hips in the correct position and also your foot screwed in causes ankle impingement, loss of range of motion and over time the general breakdown of tissue to injury. 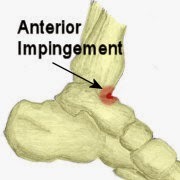 Creating the proper forces and generating externally rotated torque at your hips and feet can save you from ankle problems as well as recreate your arch. If you have problems with chronic ankle pain or loss of dorsiflexion this is a fantastic place to start. Fix It Early, Fix It Often.